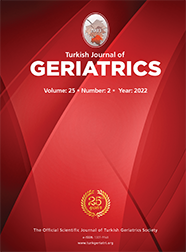 2İstanbul Medipol University Department of Radiology İstanbul, Turkey DOI : 10.31086/tjgeri.2018137967 Introduction: In this study, we aimed to determine the characteristics of neuropathic pain and clarify the relationships between the clinical signs, symptom characteristics and disability in patients with lumbar spinal stenosis. Materials and Method: Seventy-nine patients diagnosed with clinical and radiological lumbar spinal stenosis were included in the study. Pain severity was assessed using a selfadministered visual analog scale (0?10 cm). Subjective disability was measured using the Oswestry Disability Index and Istanbul Low Back Pain Disability Index. To identify neuropathic pain, the physician-administered Douleur Neuropathique 4 questionnaire was utilized. Results: A total of 79 patients (35 males, 44 females) with a mean age of 56.88±12.13 (range, 35?89) years were included in the study. The average symptom duration was 24.5 months. The Douleur Neuropathique 4 score was ?4 in 41 patients (51.8%), indicating that they had neuropathic pain. A significant correlation was observed between the Douleur Neuropathique 4 score and age (R=0.350, p=0.002), body mass index (R=0.239, p=0.034), and visual analog scale (R=0.453, p< 0.001).